Founded in 1964, Camozzi Automation quickly became a leader in industrial automation solutions. During its history, Camozzi has seen ongoing investment, enabling the brand to build and consolidate its international presence. Camozzi boasts revenues of over 215 million Euros with 6 production sites and over 1700 employees. The growth that Camozzi has been part of over the years has helped push, Camozzi, to become one of the largest industrial automation manufacturers in the world with leading technologies and customer service. Movement devices like pneumatic cylinders and drives. Electrical movement devices like electric actuators. Valves are a fundamental product for Camozzi, their vast range of valves and solenoid valves has put the manufacturer ahead of the competition. Connection devices include their super-rapid fittings, universal fittings and quick release couplings as well as tubing for pneumatic processes. Vacuum products have allowed Camozzi to offer a vast range of pneumatic components, their vacuum suction pads, ejectors and filters offer a wide range of products to complete and pneumatics project. 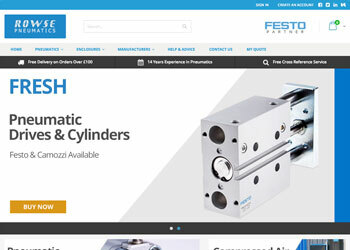 Camozzi has a vast range of pneumatic, electrical and automation products available from Rowse. At Rowse, we have been stocking Camozzi parts for many years including cylinders, suction pads, valves and connections/fittings. Speak with one of our team today to find out which Camozzi product you should be using. If you have a part from another manufacturer, our team can help you find the equivalent Camozzi part.